NASA's Opportunity Mars rover took this self-portrait in March 2014, shortly after wind had cleaned accumulated dust off its solar panels. Opportunity has been silent since June 10, 2018, forced into a sort of hibernation by a powerful dust storm. NASA's Opportunity rover has been quiet for 80 days now on the Martian surface, but that doesn't mean the plucky robot is dead. Indeed, mission team members say it's still too soon to draw any conclusions about the fate of Opportunity, which has been sidelined by a monster Martian dust storm since June 10. The golf-cart-size Opportunity touched down on Mars in late January 2004, three weeks after its twin, Spirit, landed in a different part of the Red Planet. The two solar-powered rovers embarked on three-month missions to hunt for signs of past water activity. Both found lots of such evidence in relatively short order and then continued exploring, rolling through the red dirt for years after their warranties expired. 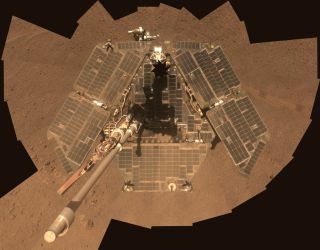 Spirit finally gave up the ghost in 2010 after getting bogged down in a Martian sand trap, but Opportunity has remained remarkably healthy and resilient over the years. No vehicle, robotic or crewed, has ever traveled farther on the surface of another world than Opportunity, whose odometer currently reads 28.06 miles (45.16 kilometers). In late May of this year, however, NASA's Mars Reconnaissance Orbiter spotted a dust storm swirling near Opportunity's locale, the rim of the 14-mile-wide (22 km) Endeavour Crater. The storm intensified over the ensuing days, throwing so much dust into the Martian atmosphere that Opportunity couldn't harvest enough sunlight to recharge its batteries. The rover fell silent on June 10, apparently putting itself in a sort of hibernation mode. And the storm kept growing; by June 20, it had become a global maelstrom, encircling the entire planet. The danger to Opportunity is very real. The rover cannot operate its onboard heaters in its current state, so Opportunity could freeze to death if the ambient temperature drops low enough. "If things get too cold, they can break," Squyres said, citing soldering joints and other key pieces of internal hardware as examples. How cold is too cold? Nobody knows. During pre-launch tests, both Spirit and Opportunity survived extended exposure to temperatures as low as minus 67 degrees Fahrenheit (minus 55 degrees Celsius). But Opportunity has endured about 5,000 taxing day-night thermal cycles on the Red Planet over the past 14.5 years, so it's unclear how resilient its internal components are today. "At what temperature do they break now? We don't know," Squyres said. The storm began abating last month, and the skies are continuing to clear, Squyres said. However, it'll probably take an extended period of relatively sunny weather — not just a single good day — to rouse Opportunity, if the rover is indeed still alive. Squyres said he's not sure if that good-weather threshold has yet been cleared. "But with the storm well into its decay phase, we have now reached the point where it really makes sense to start listening closely," he said. The team is doing just that, scouring all the communications from NASA Mars-exploring robots for any peep from Opportunity. Mission team members are also pinging the rover regularly during scheduled "wake-up times," then listening for a response, NASA officials have said. If Opportunity does pull through, the rover almost certainly won't get back to business as usual right away. The six-wheeled robot has been through quite an ordeal, Squyres stressed; it'll therefore probably take a few weeks to bring Opportunity out of whatever "fault mode" it has fallen into and assess its health and capabilities. But again: It's premature to speculate about such things right now, with Opportunity's fate so up in the air. "It's either going to be a miraculous recovery, or an honorable death," Squyres said.